Works on Desktop Safari, Desktop Google Chrome, iPhone, iPod Touch, iPad. 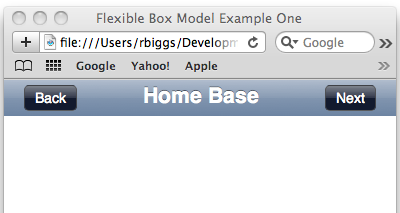 Note that I’ve included some styling for Firefox, even though it has no presence to speak of in the mobile space. In particular, Firefox 4 beta still lacks support for CSS3 keyframe animation, although that will make it into a later update. Originally I thought I would use just one popup per app, re-assigning values to the popup’s part each time the popup was invoked. However I ran into the problem of events from different and I failed to find an elegant way to resolve this. I therefore came up with a scheme where you initialize a popup at the view level, allowing each view to have a custom popup. The initializing script creates the popup and injects it as the last child of the view. The setup script creates the markup for the popup and populates it with values passed as an argument to the initializing script. The setup script also adds basic functionality to the buttons so that clicking either of them will close the popup. The setup script also creates a screen cover which traps events to prevent user interaction with what is behind the popup until it is closed. * A method to initialize a modal popup. By passing a valid selector for a view, this method creates a view based popup with the properties supplied by the options argument. It automatically binds events to both popup buttons to close the popup when the user clicks either. If a callback is passed as part of the opts argument, it gets bound to the "Continue" button automatically. *  - string: string A valid selector for the parent of the tab control. By default the an object literal. 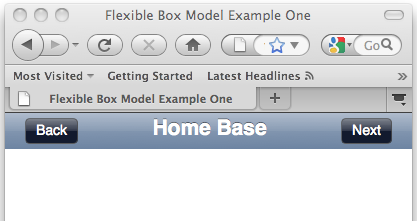 title: a string defining the title in the popup. message: a string defining the popup message. 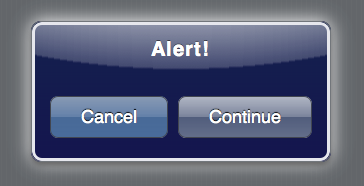 cancelButton: a string defining an alternate name for the cancel button. continueButton: a string defining an alternate name for the confirm button. callback: a function to run when the user touches the confirm button. If no title is supplied, it defaults to "Alert!". If no cancelButton value is supplied, it defaults to "Cancel". If no continueButton value is supplied, it defaults to "Continue". // Bind event to close popup when either button is clicked. // Remove this class in case the popup was opened previously. // Then add the class to trigger an animation of the message being displayed. 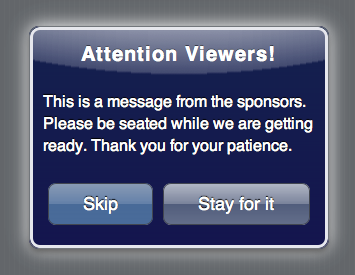 Now that a popup has been created and populated with the desired values, we need a way to show it. Before actually showing the popup, the $.showPopup method display a screen cover which captures user interaction and thereby prevents the interface behind the popup from being accessed until the popup is dispelled. The showPopup method accepts one argument, a selector indicating a uniquely identifiable node that contains the popup as a descendant. 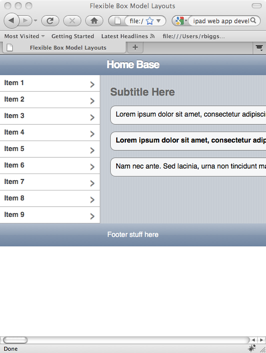 // Make the screen cover extend the entire width of the document, even if it extends beyond the viewport. OK, so we have the markup and functionality for the popup, but we don’t have the look. We’ll take care of that next. 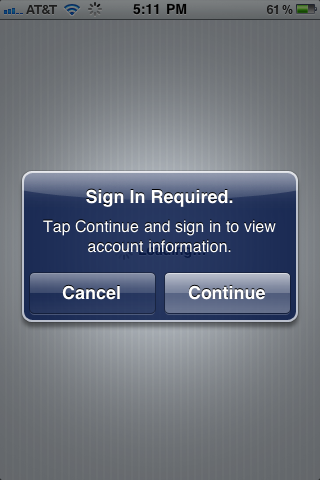 In order to create the unique look of the iPhone popup, I use several layers for encasing borders and composited transparent background gradients. Originally I had two gradients, the dark blue linear gradient and the whitish radial gradient, layered on top of each other as multiple backgrounds. But Google Chrome had a problem rendering the underlying linear gradient, ignoring its transparent alpha values and rending the colors as opaque. I was therefore forced to break them out into separate elements. The end result is the same. When the popup is created by the setup script, it is given a class of “hidden.” This defines its scale as 0% and its opacity as 0%. When we execute the showPopup method, it removes that “hidden” class. Because the popup has basic transitions properties defined on it, its scale and opacity transition from zero to full, making it appear to popup out of no where. The scripts also always make sure that the popup is centered in the viewport, regardless of where it was displayed when scrolling down a long document. For their modal popups, Apple always indicates the default button, what would be equivalent to a submit or OK button, with slightly lighter colors so that it stands out from the other button, which is the equivalent of a cancel/close button. I have the buttons located in a footer and I use CSS3’s flexible box model styles to make the buttons position and size them selves according to available space. You can try this out online or download the source code to play around with it. 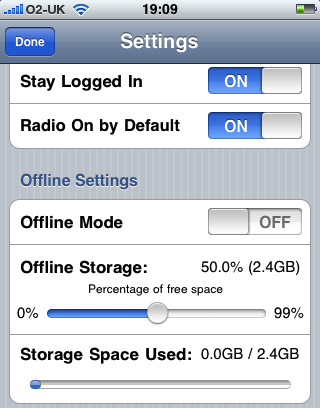 Have you ever surfed to a Web page on the iPhone or iPod Touch’s Safari browser and come across a form with standard radio buttons? It’s a pretty miserable experience trying to hit them with your finger. You have to zoom in to do so, maybe zoom in a lot. When Apple was designing the interface for the iPhone, they put a lot of thought into how to make conventional interface elements easier to use in a touch environment. If you think about it, what is a group of radio buttons but a list of items to select from. And only one item can be selected at a time. To cover this requirement Apple came up with the radio table control. A radio table is just a list of items, same as a radio button group. Only one list item can be chosen, and this is indicated by a checkmark on that particular list item which correlates to the single radio button being selected out of a group. One of the things that I really can’t understand is why people think a mobile touch interface needs radio buttons like on the desktop browser. All the other mobile frameworks are providing ways to implement the standard tiny, round radio buttons. They don’t work for touch interfaces. Get over it. The radio list works better for touch. Embrace it and love it and it will love you. Wait, I didn’t really mean that, but you get the picture. I have a hard enough time hitting normal sized controls designed for the iPhone. Heck, sometimes I can’t even find my iPhone, but that’s another issue. Notice that the last item in each list item is the radio input. Please leave this as such, since it makes it easy for us to target the actual radio button as the last child of the list items child nodes. If you have a need to add other things into the list, insert them elsewhere in the list items collection of child nodes. Styles for single choice lists. The selector radioList li > .check defines the check mark. We set it’s initial opacity to 0 so that it is completely transparent. When the user selects a list item by clicking/touching, we add a “selected” class to the list item. The selector .radioList li.selected > .check then sets the check mark’s opacity to 100%. * A method to initialize a list of radios buttons to present the user with a group of single choice options. It takes as the main argument, a unique selector identifying the view or section where the radio list resides. *  - string: string A valid selector for the parent of the tab control. By default the selector will target a class, id or tag of the radio list itself, so if you want to pass in a selector for a parent tag, such as an article, section or div tag, you'll need to make sure to put a trailing space on the end of the selector string. *  - function: function A valid function as a callback. This is optional. The callback gets passed a reference to the clicked item, so you can access it in your callback function. // Output the value of the radio button that was selected. // button list, we can use the last() method to get its value. In the above code we’re passing in a reference to the clicked list item in an anonymous function which fills a span with a class of “response” with the value of the list item’s radio button. The radio button list has an id of “#activityChoices,” so I just pass that in. If “#activityChoices” were a parent node, I would have had to written the selector thus (notice the trailing space at the end before the closing parenthesis): $.RadioButtons(“#activityChoices “); This differentiation is necessary because the selector passed in gets concatenated with “.radioList li” to set up the radio button list’s functionality. There is no way for the control to know when you are targeting the list itself or a parent node. If the selector is the list itself, “.radioList li” gets appended to that, but if the selector is a parent node, you need to indicate that with a trailing space so that the “.radioList li” gets appended with the space separating. Otherwise the resulting complete selector will not identity the radio button list properly and nothing will get initialized. I hope this is clear. Yeah, I could have written the control to check to see if the selector was the list or a parent node, but that would have resulted in a performance hit as the code would have had to do quite a bit of evaluation to determine what the selector relation was. Remember that the callback is optional. That means if you are construction a form with a submit process, then all you need to do for the radio button list is pass in a correct selector to initialize its behavior. You’ll then get the user’s choice during the submit process. You can try out an example online or download the source code. If you load this markup in a browser, it’ll be pretty plain. 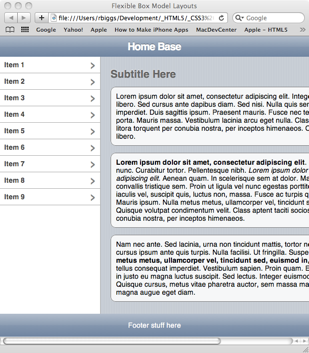 Let’s add some basic styling for the header, footer, list menu, etc. 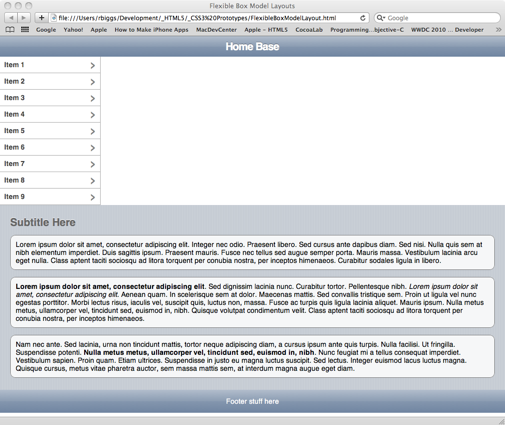 First we’ll get rid of the defaults for the body and list elements. 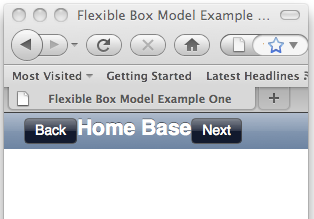 Next, for Firefox, we need to indicate that the HTML5 tags are block elements. The latest versions of Webkit in Safari, iPhone and iPad already recognize these tags and display them properly. This doesn’t look too bad, except that we want to the list to be on the left, and the content to be on the right. Normally, to achieve that we would need to put the content section before the list and float it right and then float the list left. Then we’d need to clear that float on the footer. That would work visually, except that neither the list nor the content would know about the other’s height. Or we could use relative and absolute position, and basically have the same problem. Or we could use CSS3’s flexible box model and have no problems at all, well, unless you really, really need to support IE, any version. You could use this for the god browsers and use conditional comments to give IE some crappy float arrangement. Honestly, I would to that to IE without thinking about it. This will give us cause the aside and section tags to align horizontally in their parent and each will have the same height. However in both Webkit and Firefox they both have some other issues with understanding how to deal with the long, wrapping content in the section tag. What this does is tell the browser that the child section tag’s width should be whatever space is left over from that occupied by the aside tag, it’s sibling in the same container. 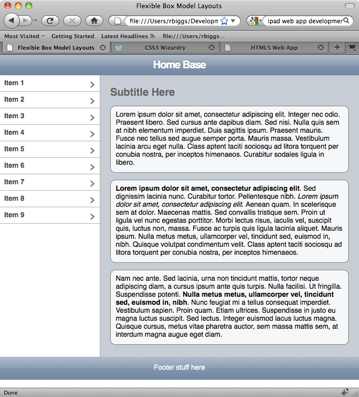 Since the aside has a defined width of 200 pixels, the browser will give the rest to the section tag. Suddenly our layout is looking and acting the way you’d expect. It will even expanding dynamically as you resize the browser window. You can try it out live or download the source. You can see it in action, or download the document. You can check out the finished page, or download it.